We haven’t done much traveling since Boston (and someday I’ll finish those travel posts… sigh) and I wanted to take a little day trip somewhere. 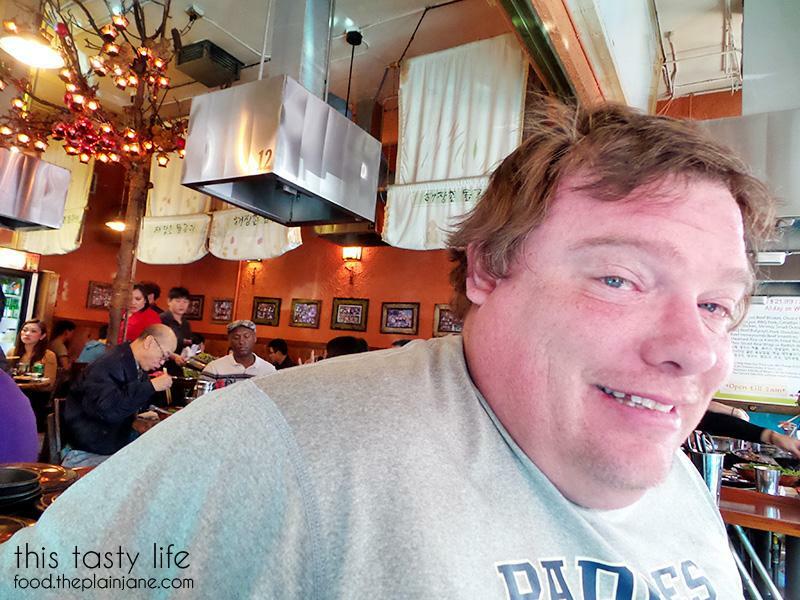 Last weekend we opted to go up to Los Angeles for a foodie adventure and to do a little shopping. Jake and I have become slightly obsessed with Funko Pops and also decided to hit up a few shops looking for pops. 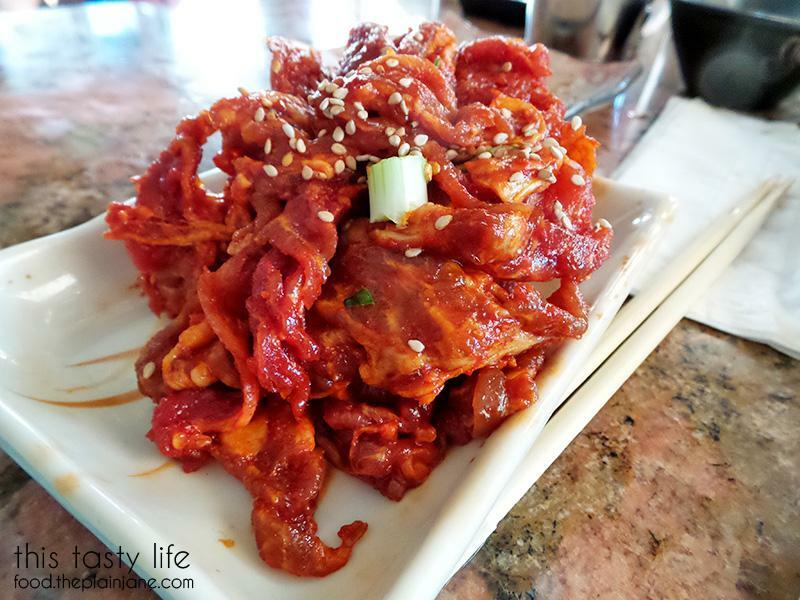 But first… lunch at a place called Hae Jang Chon! 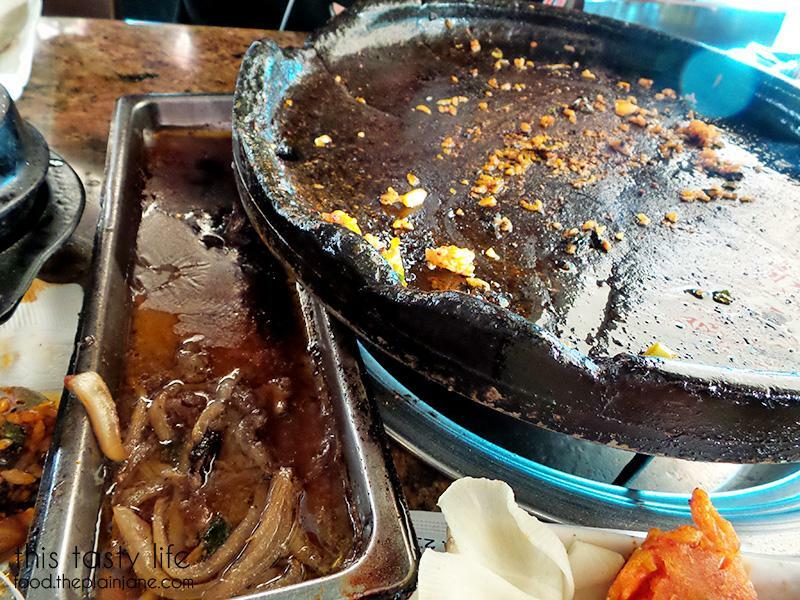 We’ve been into trying out Korean BBQ the last few weeks and I thought… well why don’t we try some in Los Angeles? 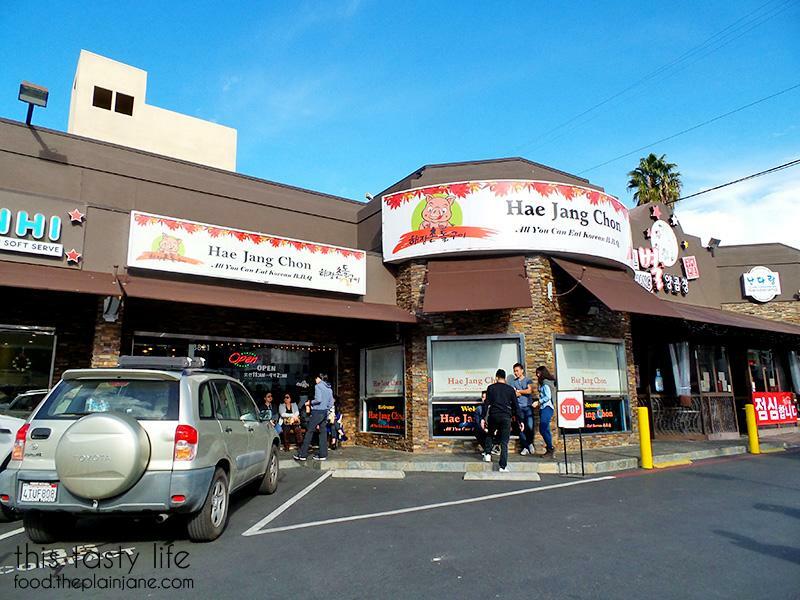 After doing a little research I opted to try Hae Jang Chon, an all-you-can-eat Korean BBQ restaurant nestled in the heart of Koreatown. I tried to make a reservation but found out they only do reservations for parties of 5 or more (bummer). We got there a little after 1PM and opted to do the $2 valet instead of circling around looking for a place to park. Funny enough, I watched the valet basically just drive my car around the block, wait for a spot to open in the tiny lot, and then park it right in front of the restaurant. Oh well, it beats looking for parking! I put our name down on the list inside the restaurant (on a little notepad near the front) and we waited. It took about 45 minutes for us to get a table. The table was all set up already and the one thing I did like was that there was three sets of tongs in a container – everyone could have their own pair of tongs, hooray! All tongs in! Everyone had this setup as their place setting. 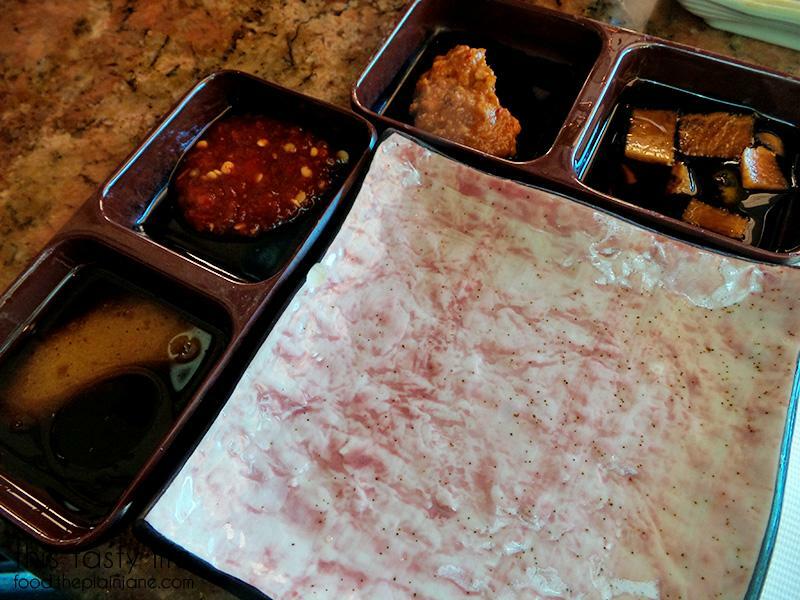 There were four different sauces/dips available at Hae Jang Chon. The one in the upper right corner was a soy based sauce that I liked the most. To the left of that is a thick soybean paste. To the left of that was something that looked really spicy (hi red peppers) and below that was sesame oil with a salty mixture in the bottom. 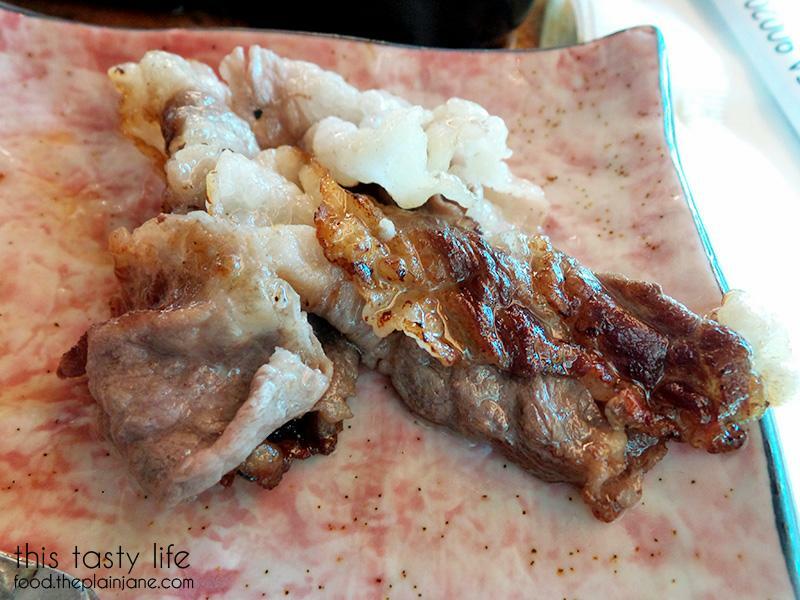 I tended to dip my meat into the soy sauce and the salty sesame oil for a mixture of seasoning and flavor. 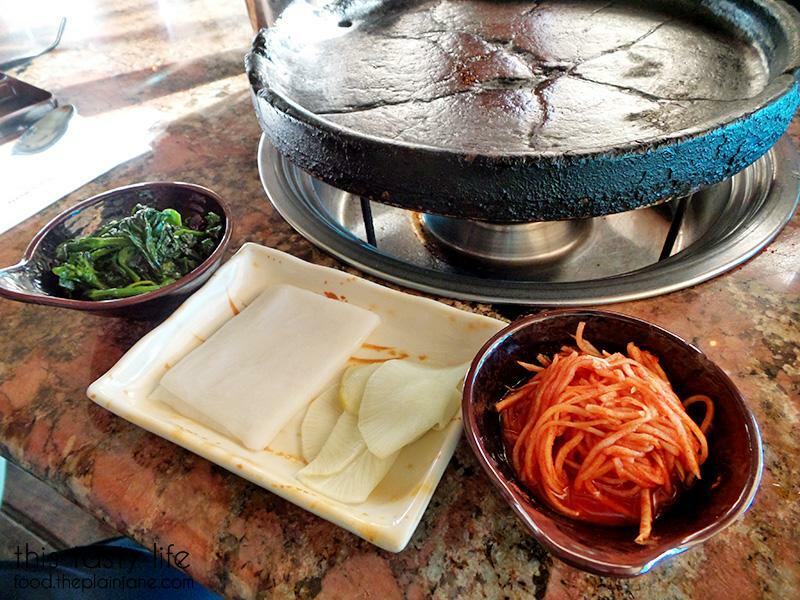 Now this is what made me choose Hae Jang Chon – their use of a special stone grill! 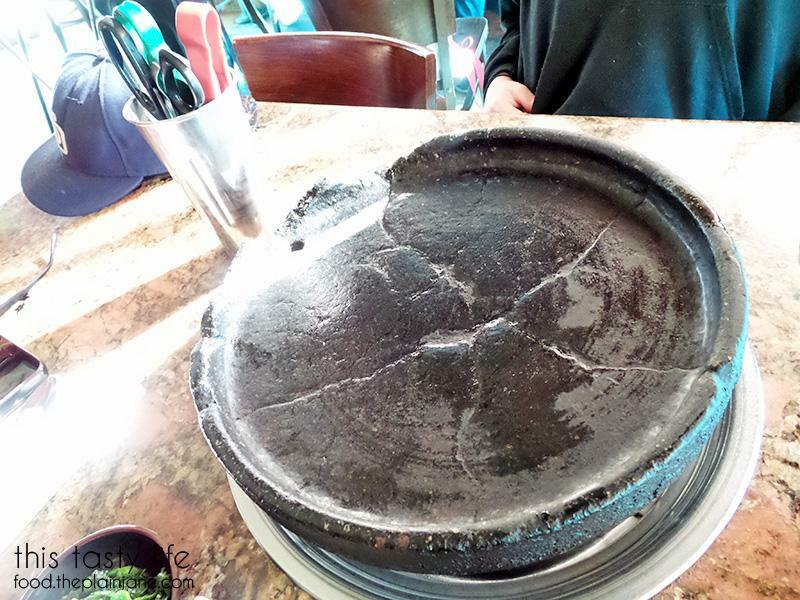 It looked a bit like a round, flat cast iron pan. There’s a hole on the side for drainage. It became apparent to us after the first round of meat why this grill was superior – mostly for the great way it sears the meat! 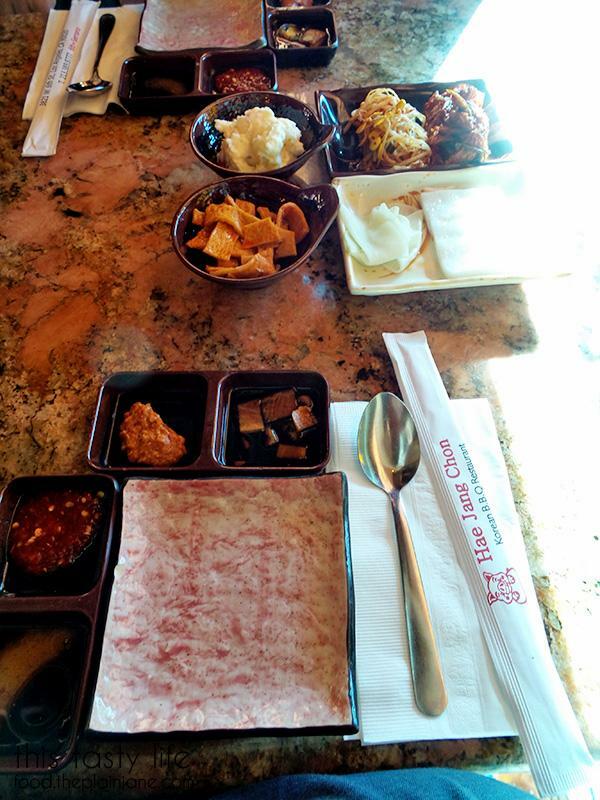 They don’t offer as many side dishes here as other places we’ve been to in San Diego. But they did have rice paper which I happily enjoyed. The only thing I really recognize here is the potato salad – which is usually the only side dish I eat. 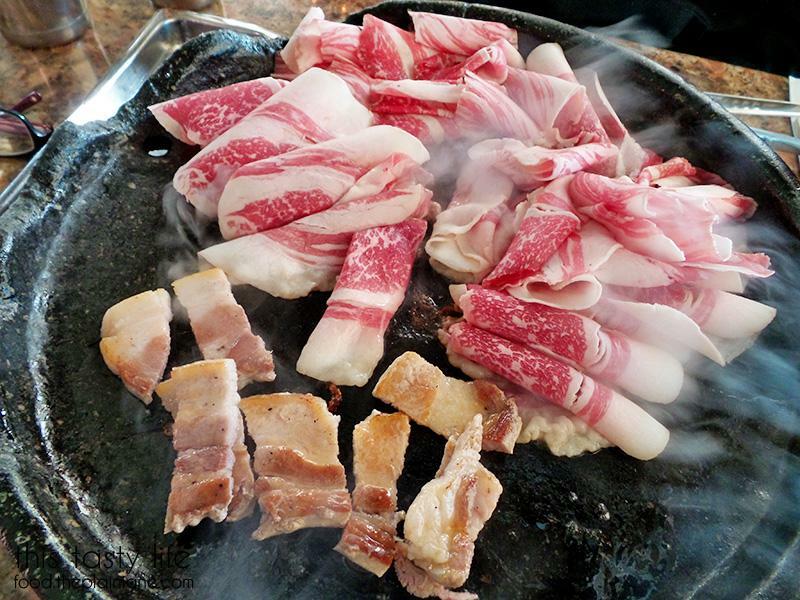 There are 16 meats to choose from at Hae Jang Chon and there are additional items as well; kimchi pancake, steamed egg, steamed rice, kimchi fried rice, bean paste soup, rice wrappers, and mushrooms. I forgot about the mushrooms, sadly! 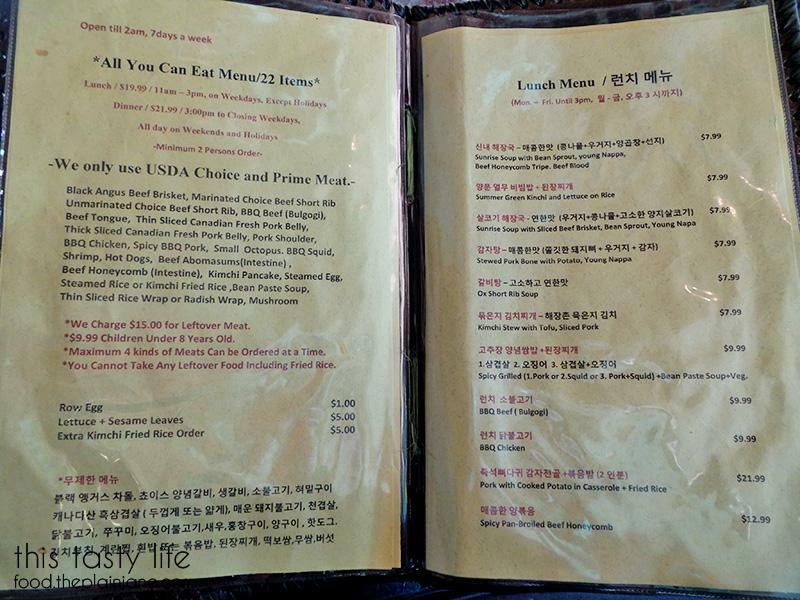 They also have a regular lunch menu. 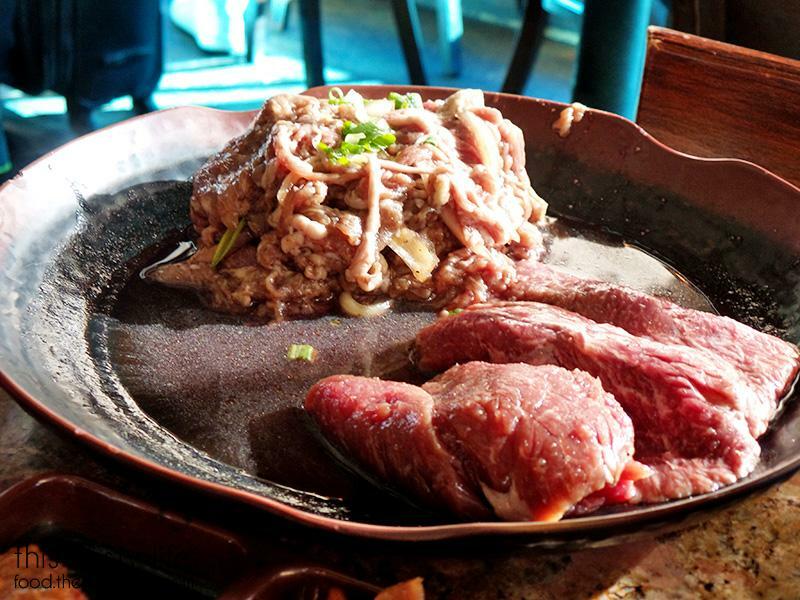 And you can order BBQ “a la carte” if you don’t want to do the all-you-can-eat thing. 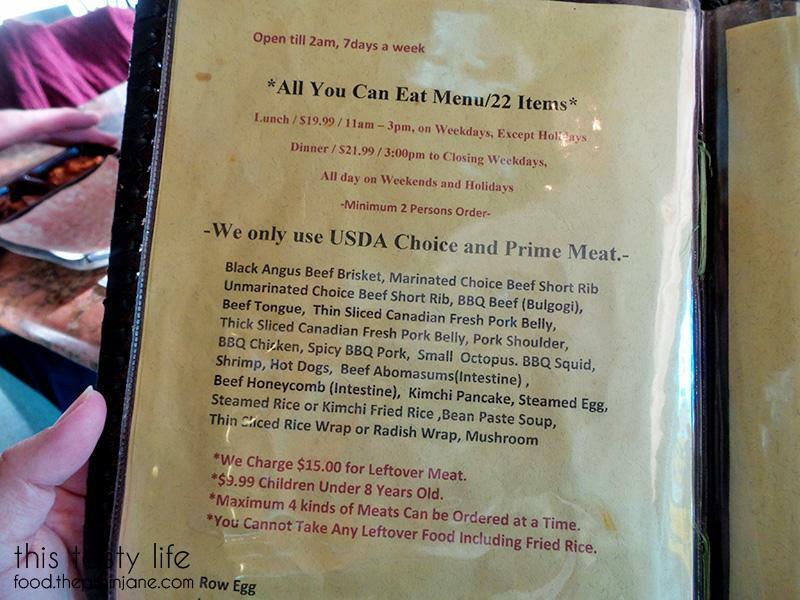 It actually took a little while to get our first order – our super friendly server told us it was because the kitchen was backed up. Another table didn’t want this one slice of thick pork belly so our server gave it to us and slapped that baby down on the grill for us. Shortly after that the brisket came… hello super marbled brisket!! Our server was really attentive even though he was hopping back and forth between several tables. He came back by and cut up the pork belly for us while we tended to the brisket. Oh… be still my heart. Look at the crispy edges of that meat! 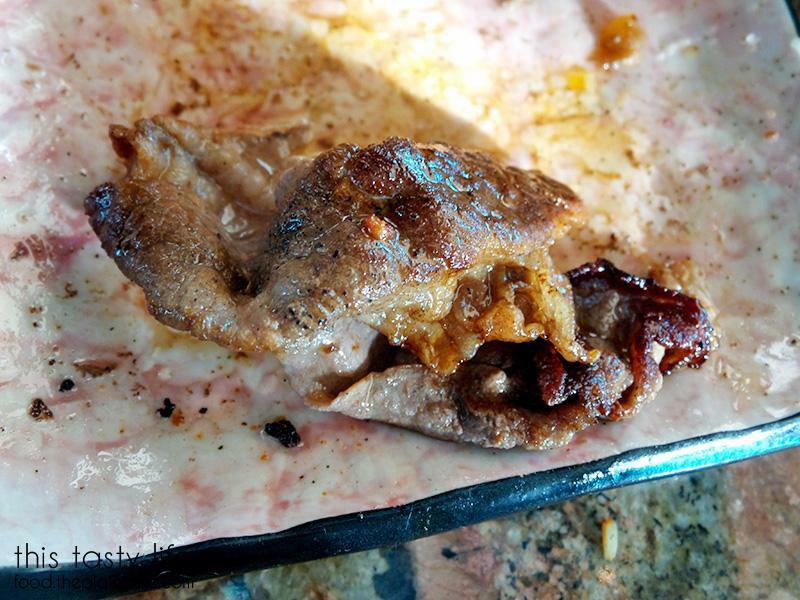 The fat really shriveled up and created this crispy edge on the meat. 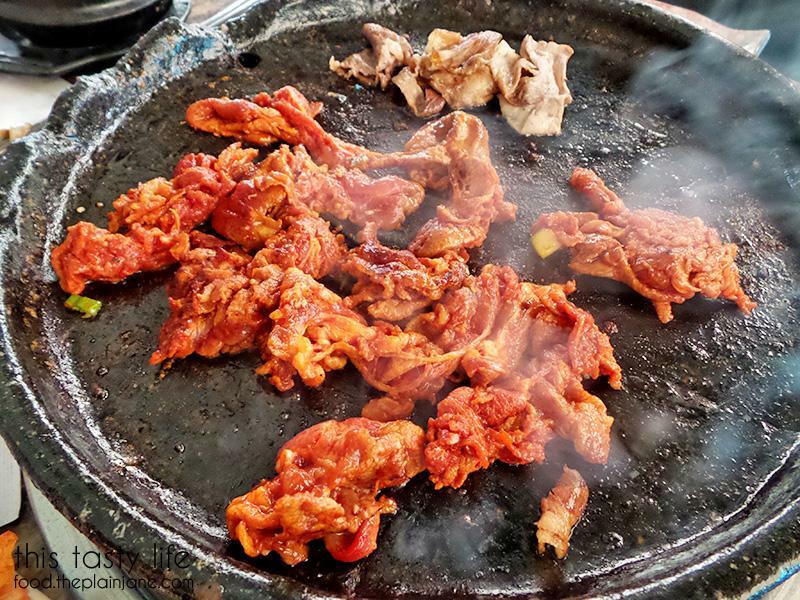 And since the meat sizzled in pork and beef juices on the hot grill, the flavor just intensified. The brisket was incredibly tender with just the right amount of fat. It was by far the best brisket we’ve tried! And as evidenced by the three extra orders we got of the brisket, it was by far our favorite of the day. 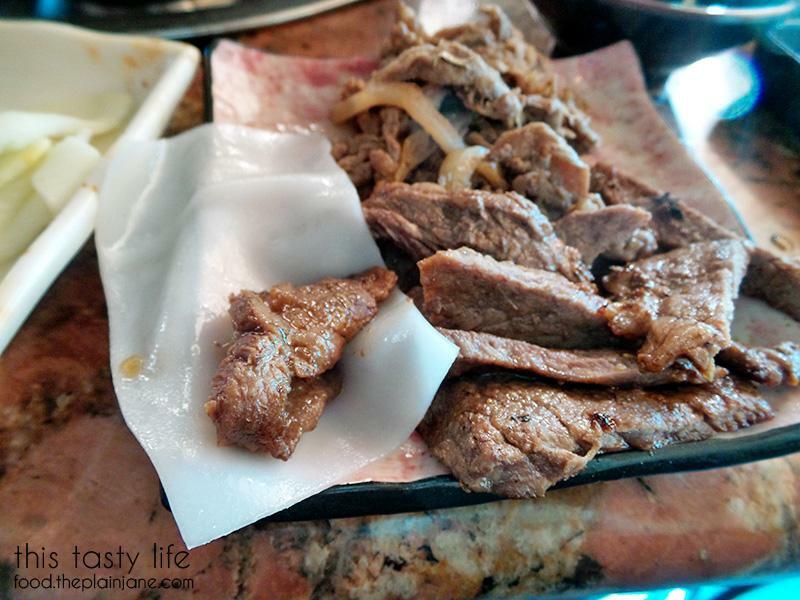 Our server recommended the next meats for us to try and said these were the most popular – BBQ beef (bulgogi – the pile in the back) and the marinated short rib. Steaming it’s way to deliciousness. 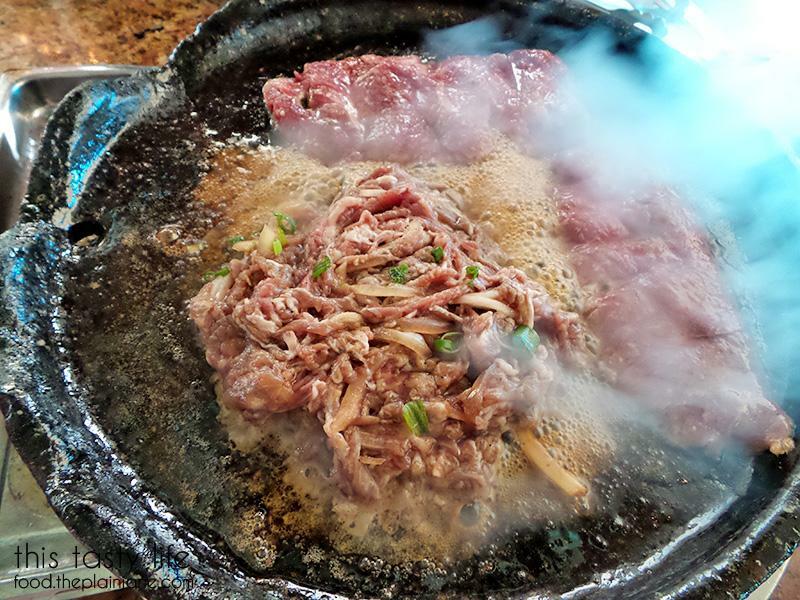 Because of the extra marinade and juices, the bulgogi didn’t get crispy edges like the brisket did but man oh man was it also an excellent dish. Very tender and a little sweet, I could see why this was a favorite. 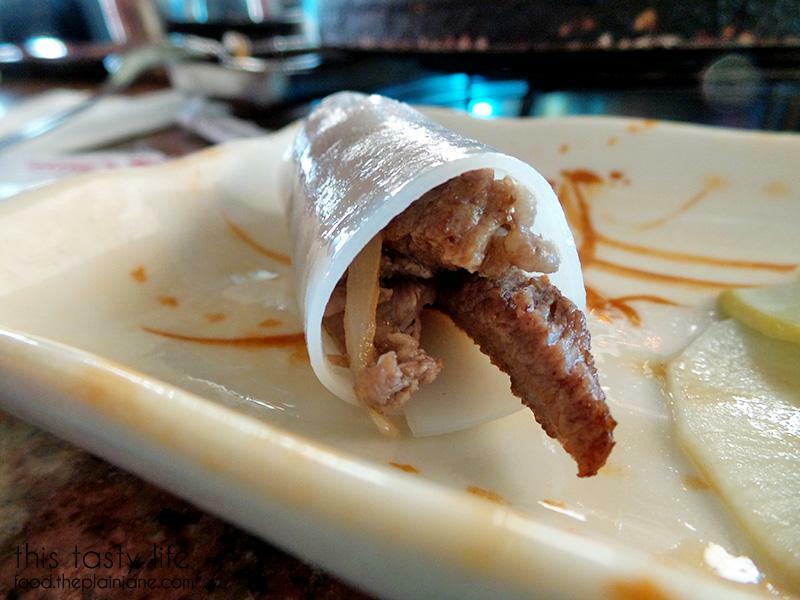 I decided to roll the short ribs up in a little rice paper with some sauces. It was kind of like a “Korean taco”, haha. 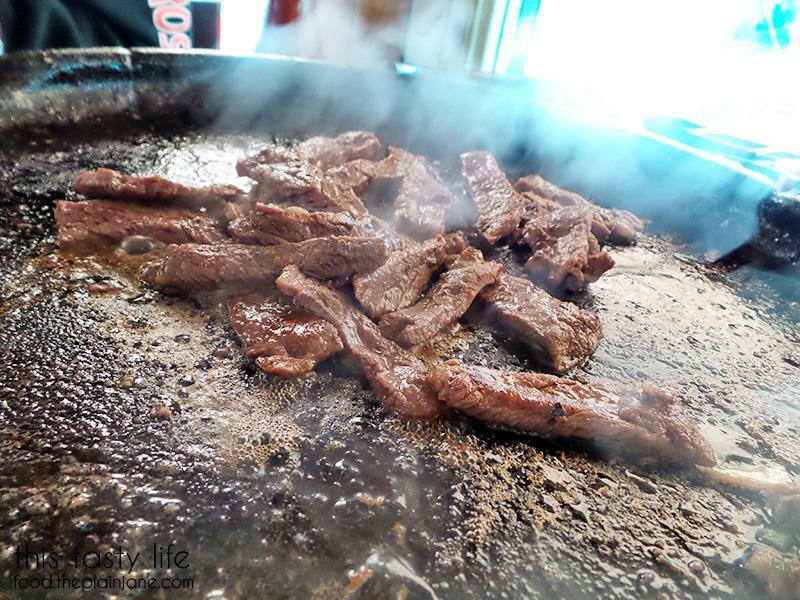 This one has both the bulgogi and short ribs in there. Crazy good! 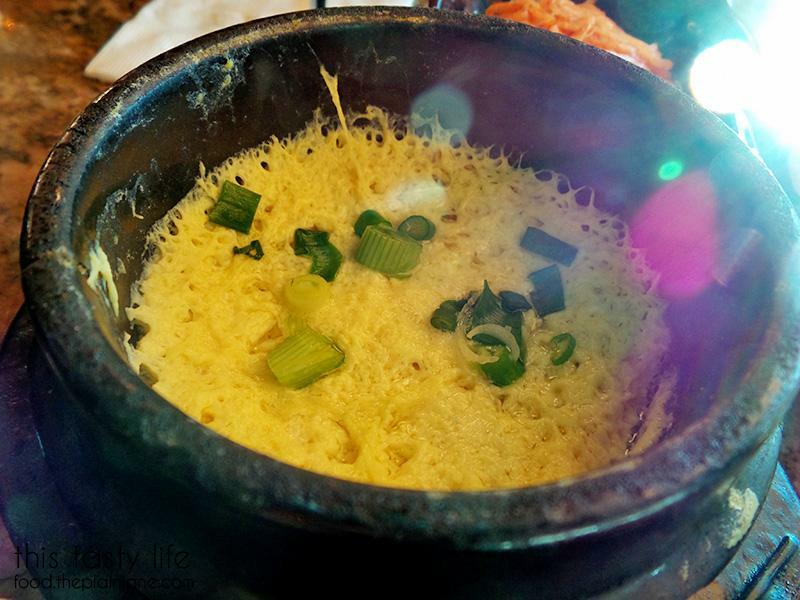 We also ordered one of the steamed eggs. It came out hot but wasn’t bubbling. It … pretty much just tasted like cooked eggs. We kind of ignored it after a sample bite. Here we have some shrimp for me, more brisket, and over on the right side is slices of thin Canadian pork belly. It looked a lot like the brisket in terms of thinness! The thick and thin version of pork belly are both excellent – you can’t go wrong with either choice (and I’d recommend trying both out). Jake ordered up a round of spicy pork. 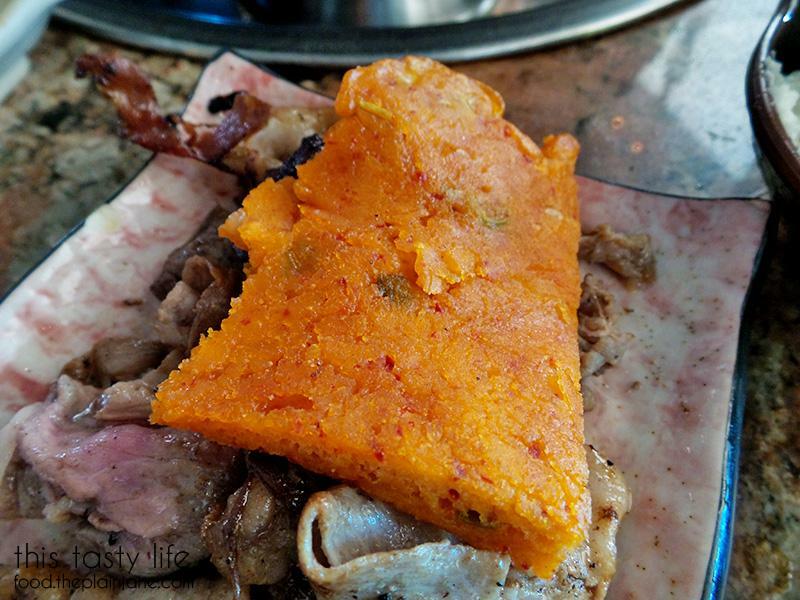 Our server said the spice level wasn’t bad on this. Hmmm. 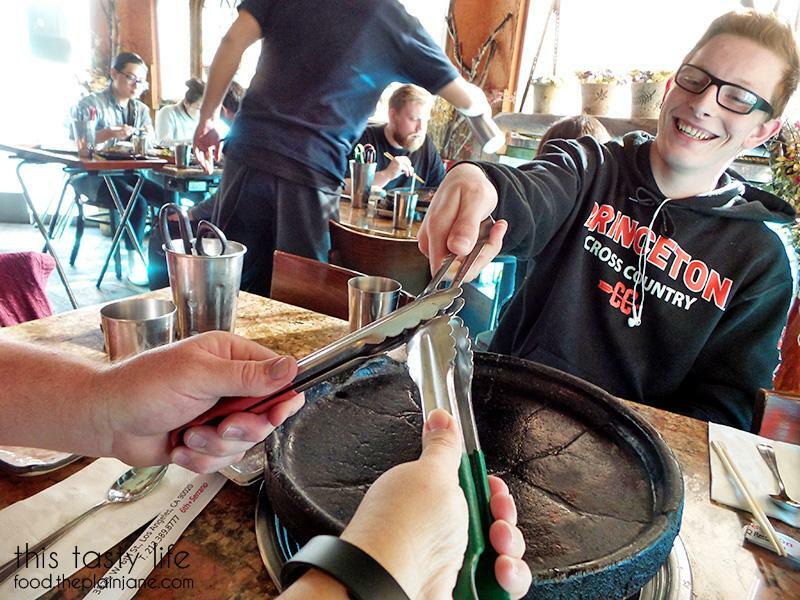 Our server was great since he’d come by and check on the food for us and tell us if things were ready or not – a much more interactive experience than other places we’ve been! 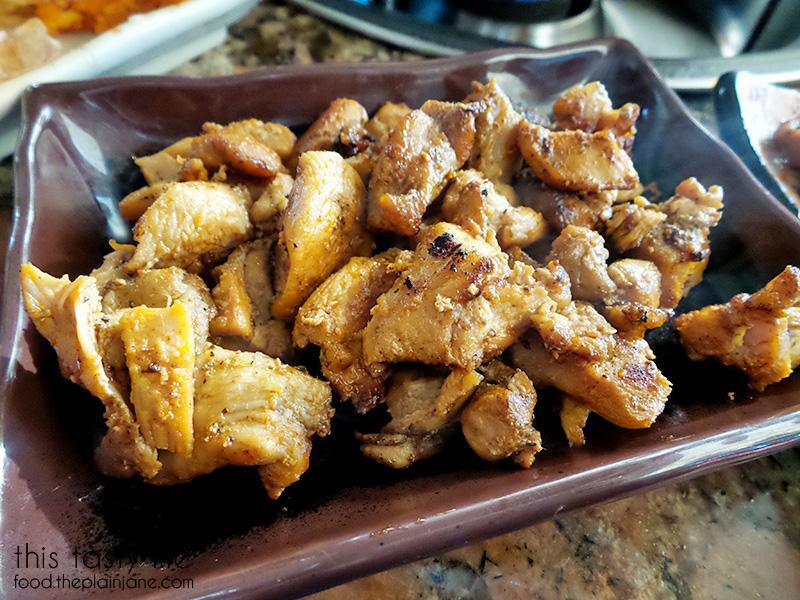 I had a tiny bit of the spicy pork once it was cooked and well, that was enough for me. One little bite was too spicy for me! Jake thought it had a good heat level – it wasn’t burning-uncomfortable hot, but it was spicy enough for him to enjoy it. T and I pretty much sat out on that one. Here’s the pork when it’s almost done along with a bit of chicken and my shrimp (which I de-shelled and put back on the grill). Grilled chicken. 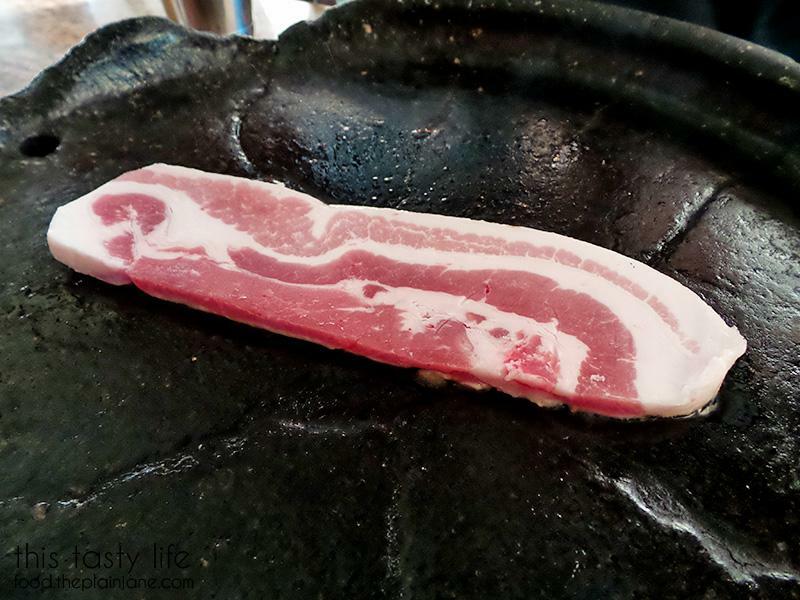 It got a nice char on it from the stone grill. Here’s my second helping of Korean potato salad with had big chunks of sweet apple in it. A refreshing and crunchy addition! 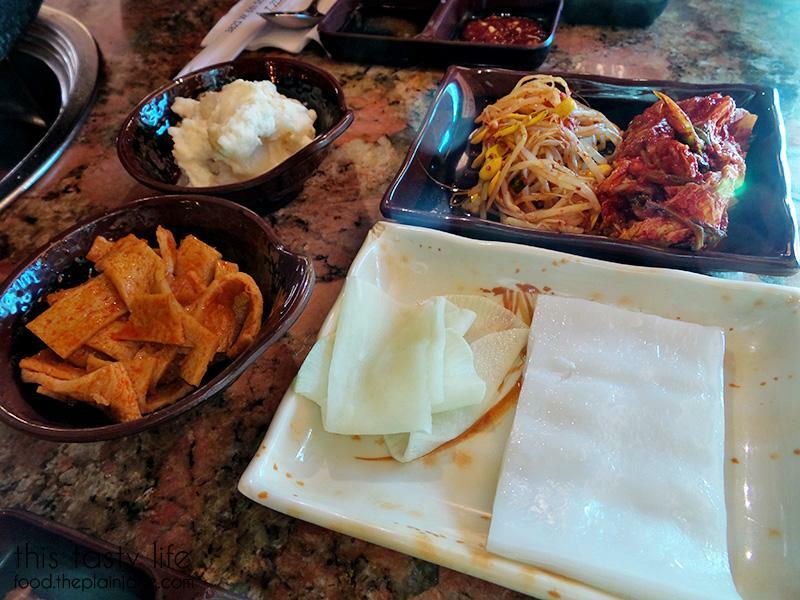 We also got the Korean pancakes, not realizing they were kimchi flavored. Too spicy for wussy Mary. This probably looks gross, but here you can see the drain/hole and the tray where all the dripping would go. 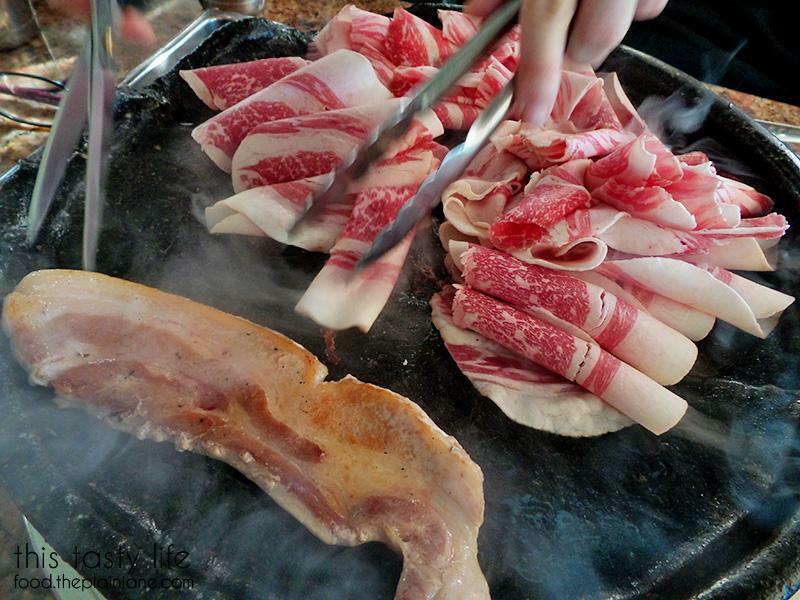 We could continually put extra fat/juices over to the hole so it would drain off the grill. 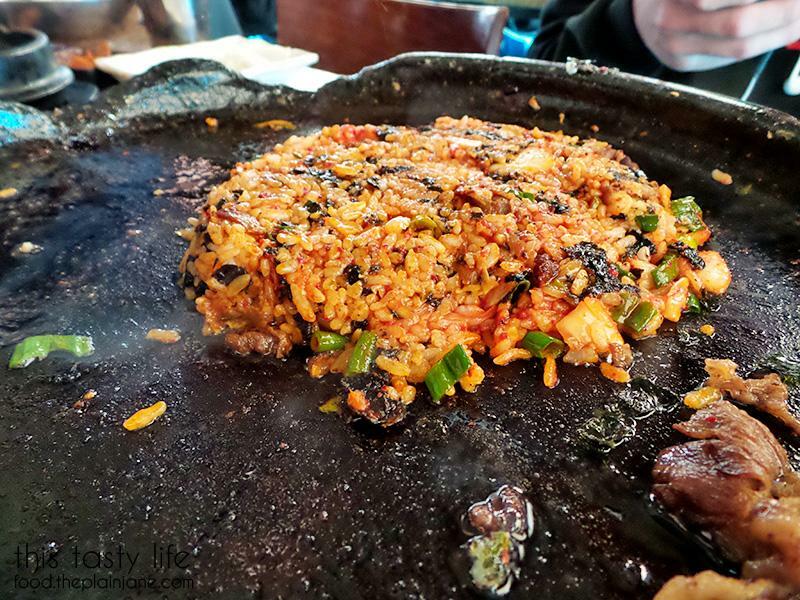 Once we were pretty much done with our grilling (they boys had another helping of brisket), they left a few pieces of brisket on the grill so our server could make kimchi fried rice! I’m sure if I wasn’t such a spicy wuss, I would have enjoyed it a lot more. It was incredibly pretty though and I love that they do this special rice at the end for you. 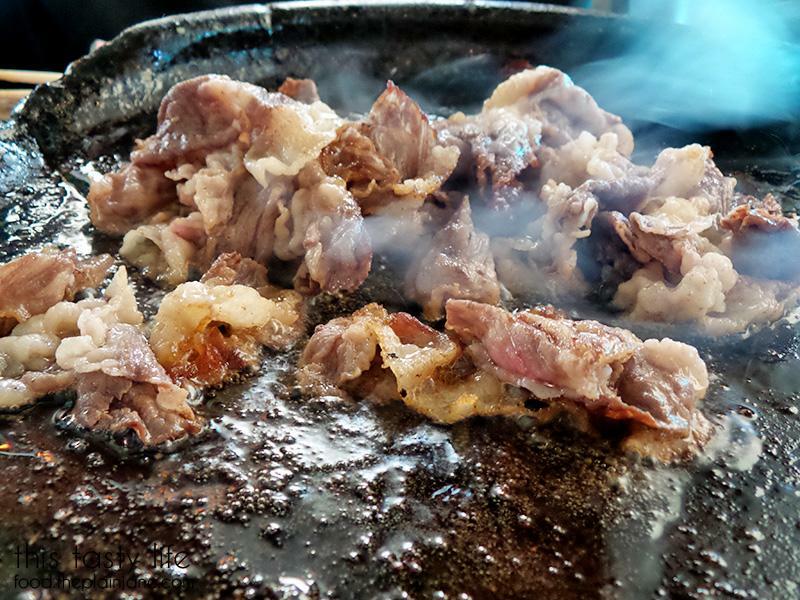 It gets a little crisp from the grill and cooks in all of those lovely meat juices. The price for weekends, holidays, and dinner here is a mere $21.95. 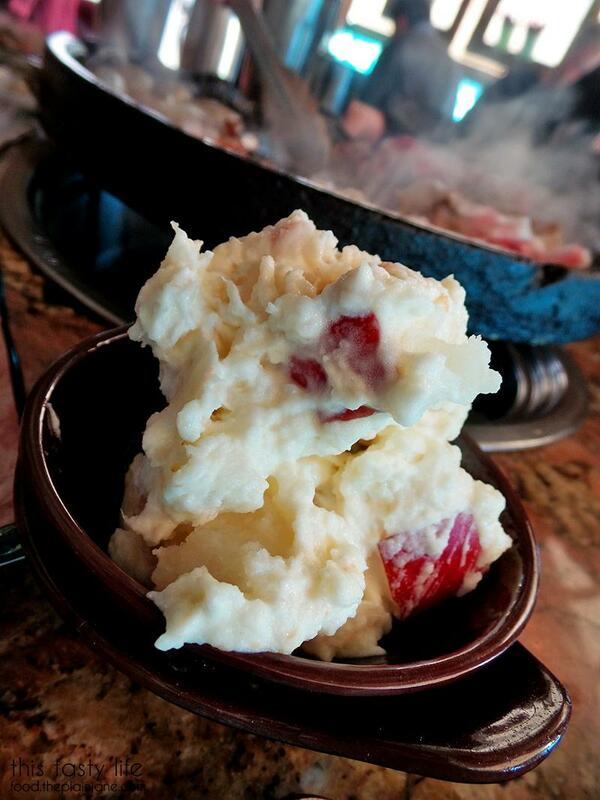 If you make it for lunch during the weekdays, it’s only $19.95. 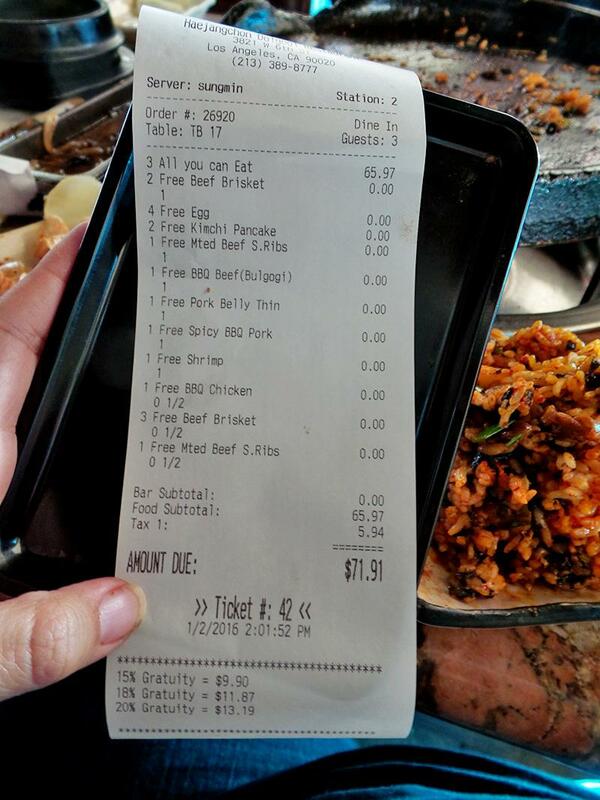 A really great deal for something that it so delicious! 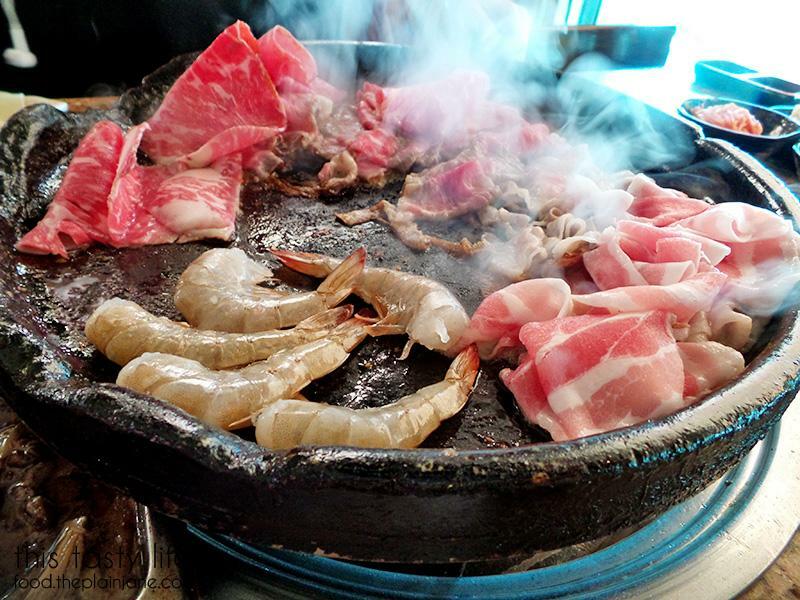 We decided to take a break from Korean BBQ for awhile but now we feel totally spoiled having this extra good Korean BBQ in the heart of Koreatown. We’ll definitely make it back here again one of these days and I hope you do, too! 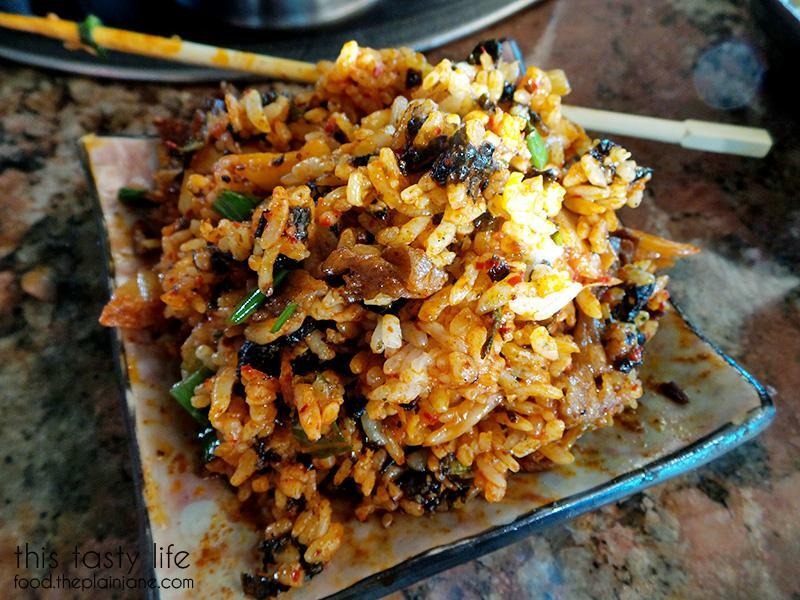 I’ve been to Korean BBQ in LA and love how they make the kimchi fried rice at the end. I think it’s awesome and smart how the boys left some brisket on the grill for the meat drippings (for the fried rice). 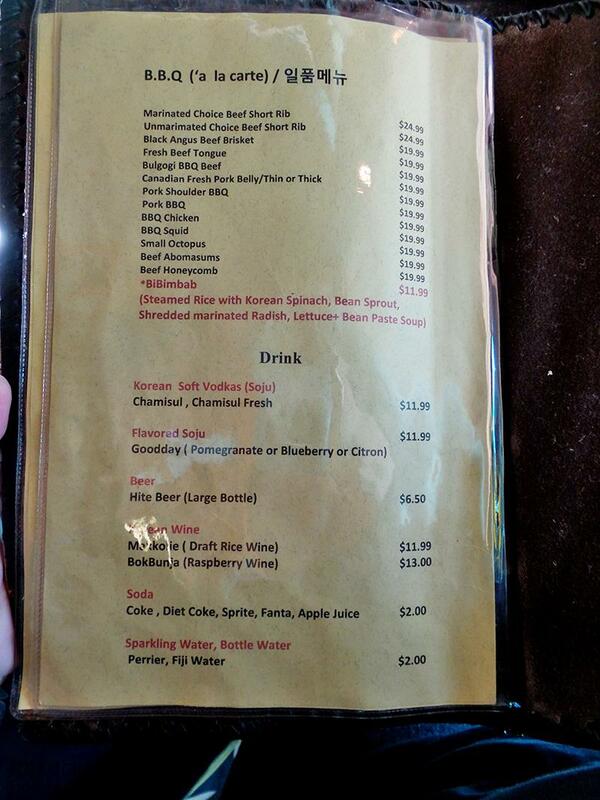 The stone grill is something I have yet to see or try so that’s something that would be fun to put on bucket list. That stone grill looks pretty ‘seasoned’ (aka kinda old). 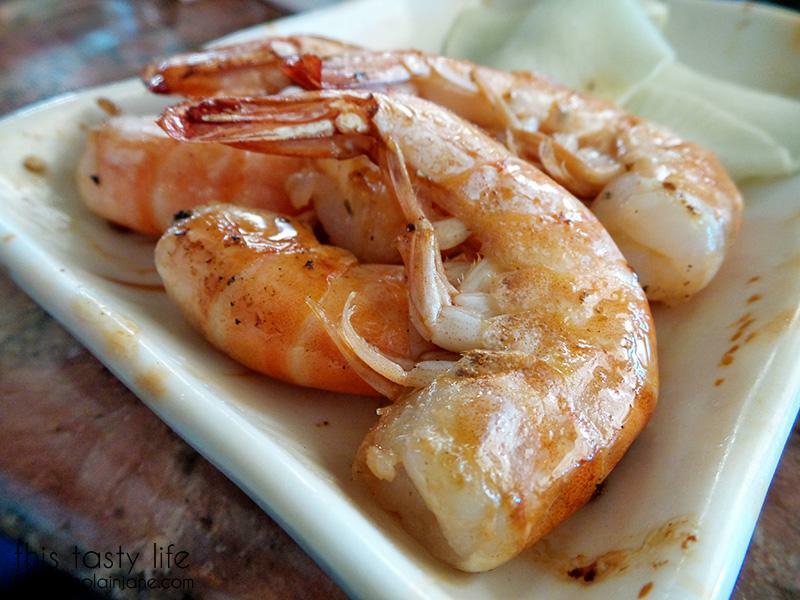 I like shrimp at the bbq but hate peeling them. So I usually use the scissors to cut them in half. That was a great post! Hi Faye – Ohhh, the fried rice must be an LA thing then – none of the places I’ve been to San Diego do it! I wonder if they would just make fried rice for us instead of making it all spicy with kimchi (I’m such a wuss). 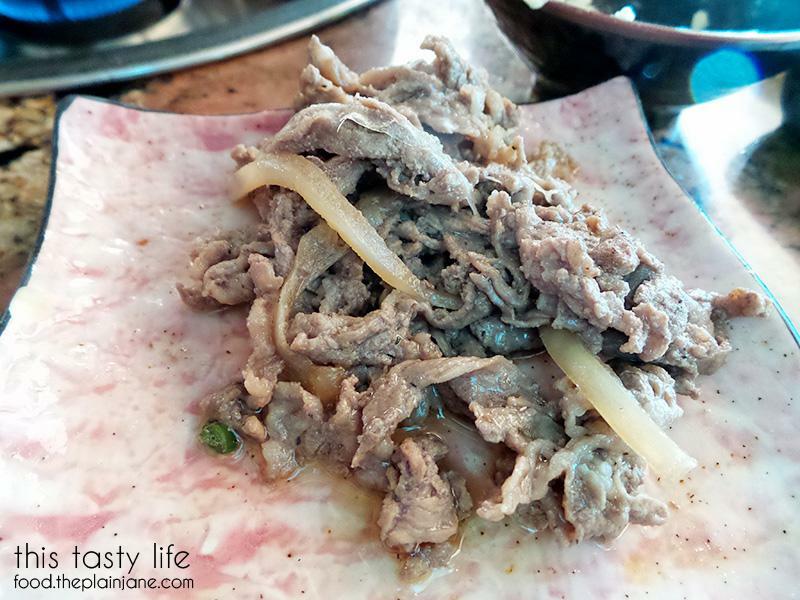 The grill was really seasoned – I think it really added to the flavor of the meat – so, so good!